Large Rubber Bar Service Spill Mat - 18" x 12"
Protect your bar top with our professional rubber bar mat. No-slip service bar mat eliminates glass breakage. This large, heavy-duty rubber bar mat is the perfect work surface for any bar. Non-slipping rubber eliminates glass breakage by gripping glasses, and the mat even cuts down on cleaning time. This glass mat is perfect for kitchen, home bar, professional bar and restaurant use. Solution to counter spill resolved! Love it. Days of wiping up spills are over. Quality material and durable. Shipping was quick and products well packaged. These mats are big and durable. High quality and easy to clean! 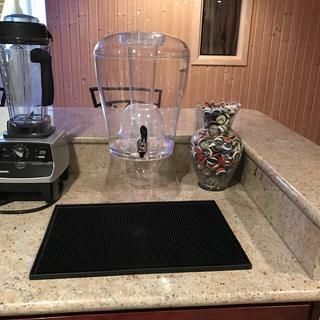 This mat is great to mix drinks on, it protects my bar's surface and the glasses don't slide when on the mat. This product worked perfectly for what we needed. We received it really quick. Would recommend this company to anyone! If I buy Rubber mats Do You Guys Rubber Imprint The Name Of My brand on It? BEST ANSWER: Unfortunately, we do not customize bar mats.